In the summer months, ice cream is our go to sweet treat. 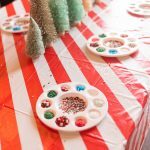 The girls and I have so much fun coming up with flavors and churning the ice cream for that evening’s dessert. One thing I love about ice cream as opposed to other treats is that it’s just so simple. It requires very little prep, my kitchen aid churns it, and a few hours later we have the best tasting homemade ice cream. 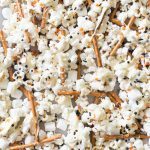 We make a ton of flavors, and over the next few weeks, I’ll share some of them here on the blog. 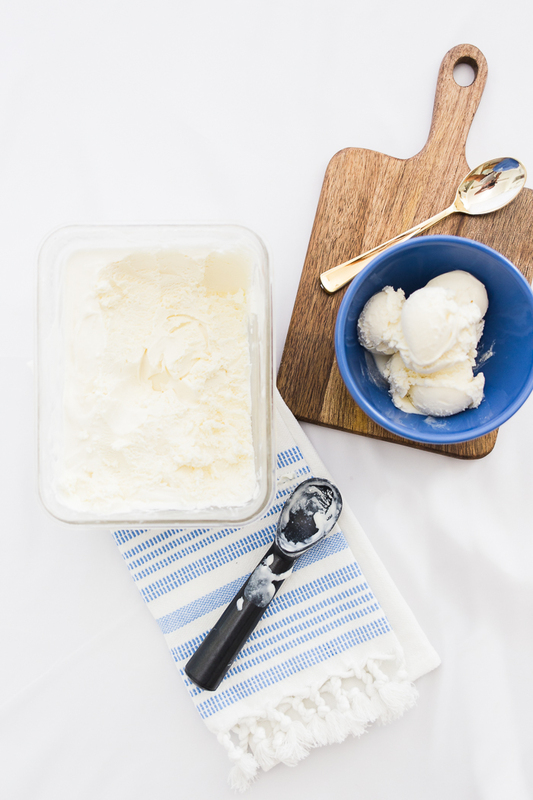 Today, I want to share the most basic of ice cream recipes, my classic homemade vanilla ice cream. 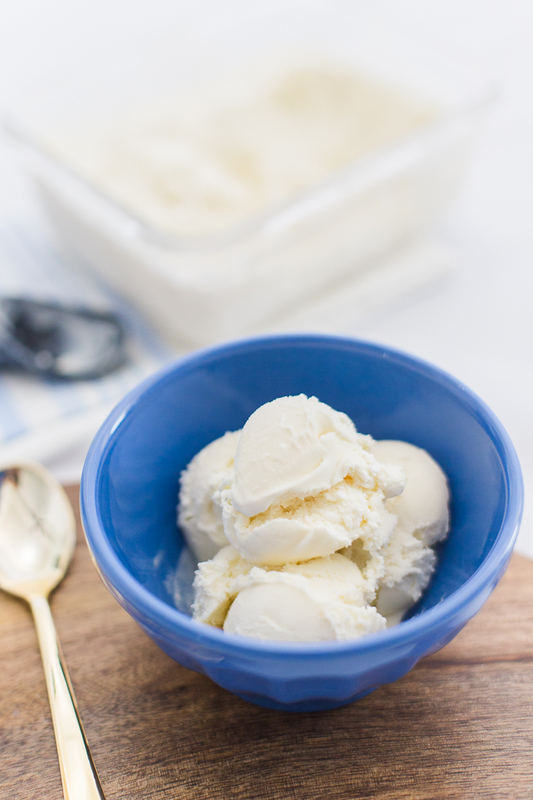 This classic homemade vanilla ice cream requires just five ingredients: cream, milk, sugar, salt, and vanilla extract. 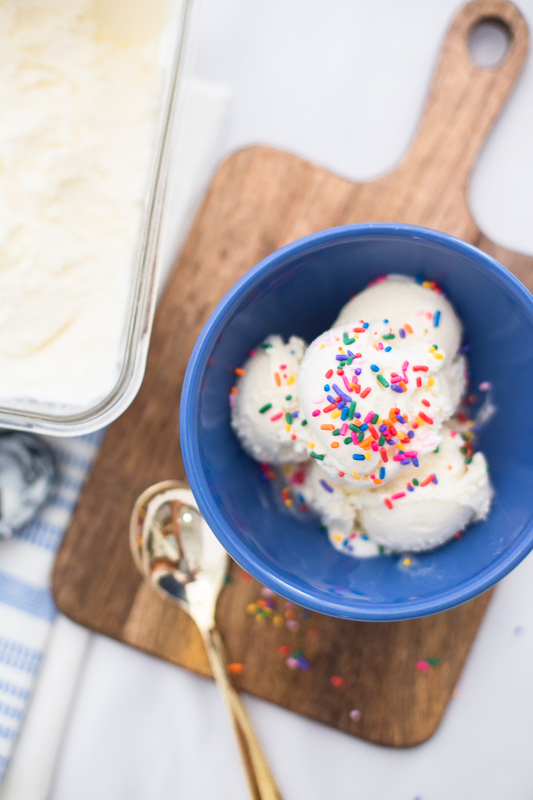 Since it’s only a handful of ingredients, it’s very easy to be ready to make ice cream at a moment’s notice (which we often do). Keep your Kitchen Aid Ice Cream Maker Attachment in the freezer. It’s required that the attachment stays in the freezer for at least two hours for the ice cream to freeze properly. I keep mine in the freezer all the time so that we’re always ready to make ice cream. I’ve found that this also helps the ice cream get nice and hard instead of a more soft churned style. Add in fresh vanilla beans (or not). I left the vanilla bean off of this recipe because I don’t often have it on hand but when I do have it I will include vanilla bean. To do so, I open the bean with a knife, scrape it into the cream while it’s warming, and toss in the whole bean. Just before churning I remove the bean. 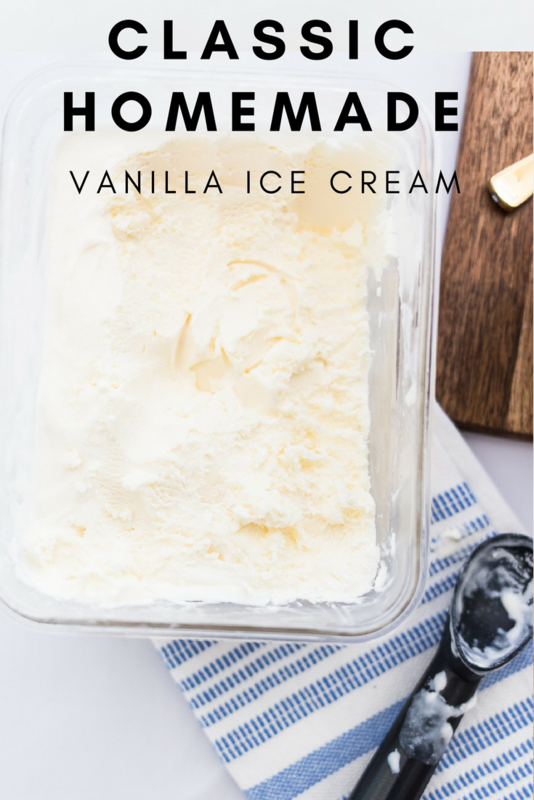 This gives is a great vanilla flavor but we all love the ice cream just as much without it. Cover your ice cream well before freezing. I usually keep my ice cream in a 2 qt glass container but I’ve also stored it in loaf pans covered tightly with plastic wrap. 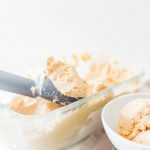 In a medium saucepan, combine 1 cup of the cream with the sugar, vanilla, and salt. Over medium-high heat, cook the mixture, stirring occasionally, until the sugar is dissolved. Remove the mixture from the heat, pour it into a medium-sized bowl. Add the remaining cream and the milk to the cream mixture. Cover and refrigerate until the mixture is well chilled, usually 1 hour or so. Churn in an ice cream maker according to the manufacturer’s instructions. And freeze until the ice cream is the desired consistency.